A pocket reference for the plays of William Shakespeare. 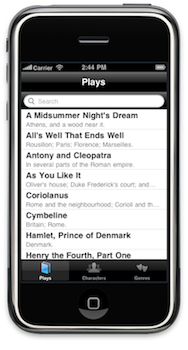 FirstFolio provides a reading interface optimized for the iPhone's display, and allows for quick browsing by play, character, or genre. Browse the contents of the 36 Shakespeare plays contained in the First Folio, published in 1623. 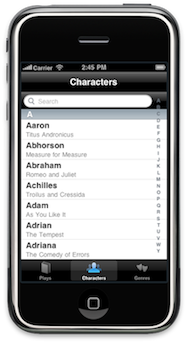 Search for characters from Shakespeare's plays, get information about them, and browse through their lines. 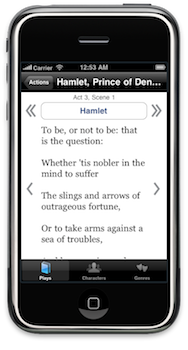 Read plays line-by-line, skip through scenes, or search through speeches for a specific quote. 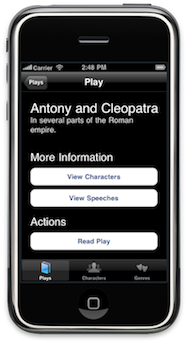 Have your place saved automatically in each play so you can pick up reading from the same spot.